“We saw about 150 patients over four weeks, and the residents gained a deeper understanding of neurology,” Berkowitz says. 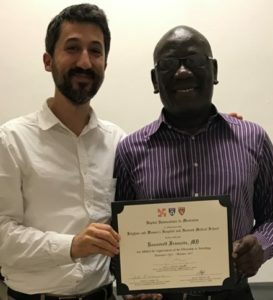 “And just as exciting as watching their clinical skills develop was seeing them turn around and teach what they learned to other residents.” Given the success of the program, HUM asked Berkowitz to collaborate on launching Haiti’s first neurology training program. Thus a two-year fellowship was born. The program accepts one Haitian doctor each year and is staffed by about a dozen US-based neurologists each of whom spends at least one week teaching in Haiti annually. 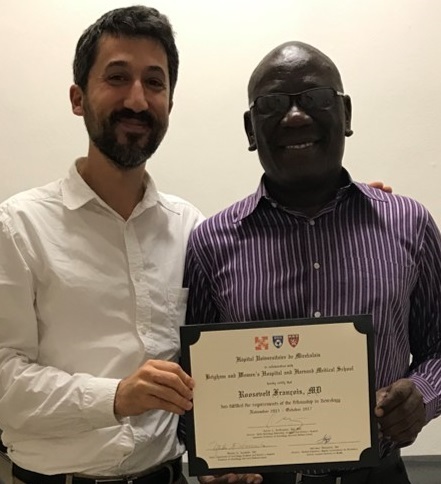 With the first graduate last year, Dr. Roosevelt François, the number of neurologists in Haiti increased by 100% growing from 1 to 2 in the entire country. HUM hired Dr. François as a faculty member and program director-in-training which fits in with Dr. Berkowitz’s aspirations. “Our hope is to have the program completely locally run over the next few years and place our graduates throughout Haiti.” If he succeeds in training ten graduates over the next ten years as is his goal, Berkowitz will have increased the neurologic capacity in Haiti by 1000%. The work has not been without its challenges. “It’s hard not being in Haiti full time,” says Berkowitz, who is full time faculty at BWH/HMS. “I am pleased that the fellows are exposed to many different visiting faculty but it sometimes decreases the continuity of education and collaboration.” Berkowitz hopes hiring Dr. François will provide both stability and improved coordination of visiting colleagues. Dr. Berkowitz serves as Director of the Global Neurology Program at BWH, Associate Professor of Neurology at Harvard Medical School, an affiliate of HMS’ Department of Global Health and Social Medicine, and Health and Policy Advisor in Neurology to PIH.